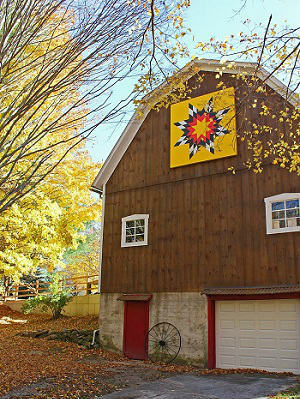 Shagway Arts Barn quilt "Blazing Star"
Mason County--home to Ludington, Scottville, Hamlin Lake and many rural communities--is well known for beaches and its beautiful countryside. But there's much more to offer locals and visitors, as Mason County is also becoming rich in culture, and there are hidden treasures throughout the county that the general public may not be aware of. To bring attention to the historical and cultural aspects of Mason County, a new "trail" system was formed. The Mason County Cultural Trail is comprised of four trails: Agricultural Trail, Barn Quilt Trail, and Sculpture Trail. Additional trails are planned for the future. The Agricultural Trail has stops in both Mason and Oceana counties. It explores the rich farmland and the crops they produce. Some of the highlights are Historic White Pine Village, Lewis Farm Market & Petting Farm, and Kistlercrest Farms. The Barn Quilt Trail features ten local barns throughout the barn that display a unique 8' x 8' plywood square with a beautiful design. It's a wonderful drive through the back roads of Mason County to view these historic barns. The Sculpture Trail focuses on a bit of art and history, wrapped up in special bronze sculptures. 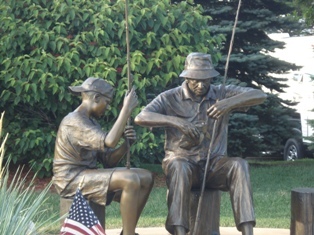 The majority of sculptures are on display at Waterfront Park in downtown Ludington. Others are found at the Mason County Fairgrounds, the library, and the Ludington State Park. The Lumber Heritage Trail showcases life in the late 1800s when the lumber economy was booming. Stops on this trail include many former homes of lumber barons, two cemeteries, and the Lumber Museum at Historic White Pine Village. Future plans include a Maritime Trail, to coincide with the Port of Ludington Maritime Museum which is undergoing renovations and hopes to open in 2016.